I received some very sad news last week from one of our priests who was diagnosed with advanced cancer. Canon Ray Unterburger has been a faithful priest for many years in the APA Diocese of the Eastern U. S. and has been serving as the Chairman of the Board of Examining Chaplains as well. We ask your prayers that the Lord will see him through this difficult and trying time and if it be his will to raise Fr. Ray back to full health and strength. Please remember his wife, Cheryl, and family and all of St. Paul’s Parish Melbourne, Florida, where he has served as Rector for a number of years. When word comes concerning someone’s serious illness, it causes us to think and reflect upon the temporariness of earthly life. As children we think that time goes so slowly when anticipating some grand event such as Christmas. I recall being at the bedside of a parishioner in one of our parishes, who had lived a long and especially full life, saying “I cannot believe my life has passed by so quickly.” It truly is a matter of perspective. I am often amazed at how some people talk about relatives and friends who are sick or who have died, but never seem to think that it is going to happen to them. That attitude is referred to as denial! On our first leg of the journey to Ecuador in April 2018, we were on a commuter prop plane flying into some really bad weather. We circled the Ft. Lauderdale airport for an hour and a half being tossed and turned because of a tornado. We prayed, if we got through this one safely, to never fly in another small prop plane and to make sure all of our affairs were in order. It was one of those come to Jesus encounters! Although Fr. Unterburger’s prognosis is not good, we continue to pray for a miracle but that in the end that God’s will be done in Ray’s life on this earth. I received some positive news recently from Father David Conway, who has been battling cancer for the past year. Fr. Dave is the Vicar of St. James of Jerusalem Church, Sarasota, FL and previous editor of Ecclesia Anglicana. He had resigned himself to the fact that he did not have much time left to live and now has been given new hope. The folks at St. James are elated at the report and are excited that the Church will continue on with Fr. Conway’s presence. Please pray for both of these faithful priests of our Church along with their families and parishes. Most of you knew Bishop Clark Dorman, a long-time priest and a bishop in the APA. Bishop Dorman died on April 10, 2018, and his Requiem Mass was at St. Alban’s Cathedral, Oviedo (Orlando), Florida, on Saturday, April 28, 2018. He was 96 years old. After leaving the Episcopal Church in 1977, where he had served a number of years, he and his wife, Peg, requested transfer into the American Episcopal Church (AEC) now the APA. He then took on the struggling mission of All Saints’ Church in Brevard County and in time he, along with his membership, built a lovely building in Port St. John, Florida, literally, with their own hands. It is presently renamed St. Patrick’s Church and is now in our Communion Partnership of the Anglican Church in America. We pray for the sweet repose of +Clark, and remember in our prayers Peg and all the family. Our Mission Team consisting of our missionary Bishop-elect David Haines, Dr. Mary Grundorf, and I visited the Indigenous Pastoral of the Anglican Province of America in Ecuador in early April 2018. It was Mary’s and my second visit there and Canon Haines third visit. The primary purpose of this trip was to visit with the clergy and discuss procedures for organizing local Church Communities in an Anglican order. This involved the clergy working with the laity to form local vestries and other committees to expand the work inside and outside each Community. On Friday, April 13, we traveled to the Community of Pomachaca where we celebrated six baptisms, a marriage, the blessing of the new roof on the church building, to which many of our APA members donated, and the blessing of the entire building, which is now complete. Following the celebration of the Holy Communion in thanksgiving for all of God’s blessings, we were guests at a dinner of native cuisine. On Sunday, we visited the property and buildings which have been purchased for use as the Headquarters for the Pastoral in Guamote. Additionally, thanks be to God for the benefactor with Worthy Endeavors Ministries, the property across from the administration building was purchased for the future Seminary and Cathedral Church building. As their Bishop, I did the Form for Blessing and Laying the Foundation Stone for the proposed complex with many of the local members of the Community along with various dignitaries there for the grand occasion. We finished Sunday’s festivities with a Marriage Ceremony of one of the newly ordained priests and his bride at a nearby village Church. The expected numbers of people for the wedding was so large they had a large tent outside the church building to accommodate everyone. There were over a thousand people there. Following the wedding and Eucharist, there was a grand wedding party at the new home of the bridal couple. This year the DEUS has celebrated a record number of Ordinations to the Diaconate and Priesthood. Some were listed in my last Epistle and several more are listed in this Epistle in our Ad Clerum column with names dates and assignments. The Lord has truly blessed us with these men and their wives who have committed themselves to service in God’s Kingdom. We need to pray earnestly for openings in parishes where these men can serve. This means making a commitment for all of us to raise the necessary funds to provide these men parish/Curate opportunities, even temporarily, to work along with a seasoned parish priest. The DEUS is attempting to set aside funds each budget year from any overage into a curate fund. Most of all pray for God’s guidance for these men and their families. As I write today, it is Ascension Day in the Church. It has historically been the most forgotten feast day of the Christian Year. As we extinguish the Paschal Candle on this Day we close the 40 days of the Season of Easter and enter Ascensiontide. The Disciples were reminded by two men who stood by them in white apparel, “Ye men of Galilee, why stand ye by gazing up into heaven? This same Jesus, which is taken up from you into heaven, shall so come in like manner as ye have seen him go into heaven.” We have the promise of our Lord’s return and also the comfort of the promise of the Holy Spirit which was completed on Pentecost. We have the promise of spiritual gifts through the presence and power of the Holy Spirit which will sustain us throughout our lives. May we all pray earnestly that we use the unique gifts and talents we have been given to serve our Lord and His Church until that Day comes when he returns. Finally, a reminder to all about Synods this year. The DEUS will be meeting in Charlotte, NC, this summer, July 16-20, 2018. It will be an historical Synod being our 50th Anniversary. Along with the business and our worship together, we have Bishop Ken Myers returning for two developmental sessions. Another special time together will be the Synod Eucharist when we will be Consecrating Bishop-elect David Haines as the Missionary Bishop for our Global Partnerships. The Diocese of Mid-America will be holding its Synod in San Antonio, Texas, at St. Chad’s Anglican Church. The dates are July 26-27, 2018. There will be some special events planned for this Synod which is the first to be held in the historic city of San Antonio. The Diocese of the West will be meeting in Portland, Oregon hosted by St. Michael’s Church. The scheduled dates for their Synod are November 2-4, 2018. A reminder to those who have not sent their Lenten Appeal Funds in as of yet. Please forward them to the Treasurer D. J. Fulton. We have a good start on completing our goal, but we still have a long way to go. The Plan is for a second school for the Dalit children in South India close to our Cathedral in Jammalamadagu. Also, Fr John Klein will be sending out a flyer soon for you to post on the Holy Land Tour scheduled for February 2019. We are excited that many of us will have the opportunity to go with the experienced Tour Guides of our own Fr. John Klein and Bishop Chad Jones! God bless each of you for the work you do and for your love and support. DEUS: Mr. Carlton Bridgewater was ordained to the Diaconate on April 21, 2018, at St. Alban’s Cathedral, Oviedo (Orlando), FL. Deacon Bridgewater will serve as Deacon at St. Alban’s Cathedral. DEUS: Mr. Thomas Houghton was ordained to the Diaconate on April 28, 2018, at St. Paul’s Church, Crownsville, MD. Deacon Houghton will serve as Deacon at St. Alban’s Cathedral. DEUS: The Rev. Mr. Tyler Phass will be ordained to the Sacred Order of Priest on May 26, 2018, at St. Paul’s Church, Melbourne, Florida. 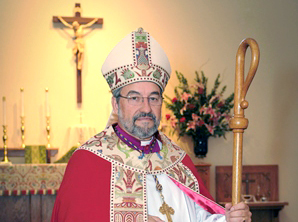 He will continue to serve as Curate at St. Paul’s Church. Fr. Ray and Cheryl Unterburger, Bishop Hanlan and wife, Joan; Fr. Sweeney; Deacon Al Ryan’s wife, Claudia; Bishop Shaver, Fr. Conway, Fr. Carter; Fr. Bakley; Fr. Gardner. RIP: The Rt. Rev. Clark Dorman. Apr. 6-8: Confirmations and Receptions, St. Philip’s Church, Blacksburg, Virginia. Apr. 10-16: Visit and selection of property for Seminary, Anglican Province of Ecuador. Apr. 19: G-4 Archbishops Conference Call, Oviedo, FL. Apr. 21: Ordination of Mr. Carlton Bridgewater to the Diaconate, St. Alban’s Cathedral, Oviedo, Florida. Apr. 28: Ordination of Mr. Thomas Houghton to the Diaconate, St. Paul’s Church, Crownsville, Maryland. May 2-4: Bishops’ Meeting of the Anglican Joint Synods, Saint Luke’s Church (ACA), Amherst, NH. May 6: Visitation to St. Paul’s Church, Melbourne, FL. May 19-20: Episcopal Visit, St. Matthew’s, Weaverville, NC. May 26: Ordination of Dcn Tyler Phass to Sacred Priesthood, St. Paul’s, Melbourne, FL. May 27: Episcopal Visit, Holy Trinity, Fernandina Beach, FL. July 16-20: DEUS Synod, St. Michael’s, Charlotte, NC. July 26-27: DMA Synod, St. Chad’s, San Antonio, TX. May 20: Episcopal Visitation, St. Paul’s, Cincinnati, OH. Jun. 13-15: Banquet Speaker and Attendee, ACC, Diocese of New Orleans Synod, Metairie, LA. Apr. 15: Episcopal Visitation, All Souls’ Church, Asheboro, NC. Apr. 25-27: APA representative to the Synod of the Diocese of the Holy Cross (DHC), Cathedral of the Epiphany, Columbia, SC. May 18-20: Episcopal Visitation and Confirmations, Saint Alban’s Church, Joppa, MD. May 29: Federation of Anglican Churches in the Americas (FACA) Meeting, Saint Barnabas Church, Dunwoody, GA.
Jun. 3: Ecumenical Visit, Saint Luke’s Church (ACC), Augusta, GA.
Jun. 10-15: Counsellor at Anglican Legacy Camp, Westfield, NC. Jul. 17-20: Synod of the APA Diocese of the Eastern United States, Diocesan Board of Examining Chaplains meeting, Diocesan Standing Committee meeting, St. Michael’s Church, Charlotte, NC. Apr. 28: Celebrant, Bishop Clark Dorman Requiem Mass, St. Alban’s Cathedral, Oviedo, FL. May 8: Southeast Florida Traditional Anglican Clericus, Boca Raton, FL. May 26: Attendance of the Ordination of the Rev. Mr. Tyler W. Phass to the Sacred Order of Priests, St. Paul’s, Melbourne, FL. Jun. 19: Southeast Florida Traditional Anglican Clericus, Boca Raton, FL. Jul. 16-20: Synod of the APA Diocese of the Eastern United States, Diocesan Standing Committee meeting, St. Michael’s Church, Charlotte, NC. 14 The Rev. Canon Robert Hawkins, V.G. Please contact the APA Office at 800.480.1087 or at apadeus@cfl.rr.com if any of dates are in error or a date has been omitted.